You may have seen the big roomy bag made from one of the Hoffman Dream Big panels or another focus fabric! 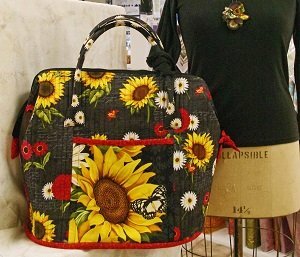 Joan is going to teach this great travel bag in a 2-day class! Choose your favorite large print to highlight the outer pockets of this sturdy bag and you will have a one-of-a-kind piece! Leave your machine here overnight so you don't have to carry back & forth both days! Click here for the Poppins Bag supply sheet.